The Cincinnati Bengals have announced that they have placed offensive tackle Jake Fisher on the reserve/non-football illness list, which will end his season. Fisher has been battling an undisclosed medical issue for the last month, and it forced him to leave his team’s Week 9 contest against the Jacksonville Jaguars. The team re-signed veteran Eric Winston in a corresponding roster move. Fisher, a second-round pick of the 2015 NFL draft, has struggled during his time as a pro, earning overall grades of just 65.6 and 47.8 in 2015 and 2016, respectively. Through nine games of the 2017 season, he played 361-of-462 offensive snaps and his overall grade of 45.3 currently ranks 58th of 78 qualifying tackles. In his nine games, he played a total of 215 snaps in pass protection and allowed 16 total pressures, including four sacks, resulting in a pass blocking efficiency of 94.0 that ranks 43rd of 76 qualifying players at the position. However, he’s struggled more in the running game. Through nine weeks, his run blocking grade of 37.0 is good for 66th among offensive tackles. 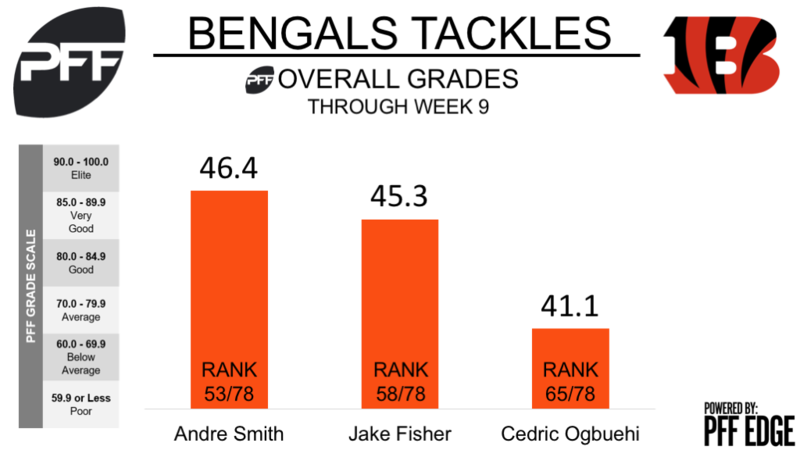 With Fisher out, the Bengals will turn to ninth-year veteran Andre Smith, who has been working in a rotation with Fisher to try and tighten up an unsteady offensive line. While Smith’s pass blocking efficiency of 92.4 ranks below Fisher’s, Smith’s performance in the run game (44.9 run-blocking grade) may provide a slight upgrade to the unit.